Banded Herring pictured next to a 2nd cycle Lesser Black-backed Gull. Berrien County, Michigan. 20 September 2015. I reported the following sequence to the Bird Banding Lab that night: 0846-10957. All the Herrings that I've submitted to the Bird Banding Lab (BBL) in the past have been between 1-12 years old. So you can imagine my surprise when the following banding date came back: 28 June 1986. 29 YEARS AND 3 MONTHS OLD!! Coincidentally, I had two other banded birds on this day and reported them too. The next morning I received Certificates of Appreciation for these two gulls, but not the 29-year old. It was flagged due to its old age. The BBL asked for more details as to how I retrieved the band number and requested photos from me. This is standard protocol for older birds. But not just "any old" bird. 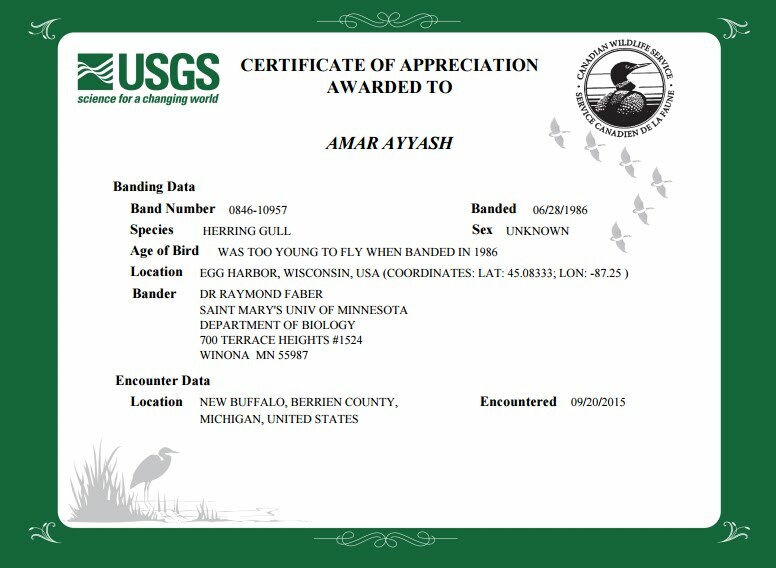 Little did I know that my report was going to set a new Herring Gull longevity record in North America. "Hi Amar, Excellent photos, thank you for sending them. This confirms 0846-10957, 29 years 3 months old, and the new longevity record for the species. It's a good thing the bander used a hard metal band! You'll have to keep an eye out for this bird in the future. This record will get posted to our longevity website, which I'm coincidentally working on updating this week so it should show up soon. This is actually the first time this bird has been reported to us. Banded as a "local" or still dependent bird on 6/28/1986 in the 10 minute block designated as Egg Harbor, WI. The permit is still active that banded it, St. Mary's University of MN, Dr. Raymond Faber." "Amar, this is fantastic news! A new record for longevity in North America! I banded the bird on Hat Island (which is nearest to Egg Harbor) on June 28, 1986 as you reported. Wow! Keep looking for it. Thanks so much for your tireless devotion to the gulls." And so there you have it. 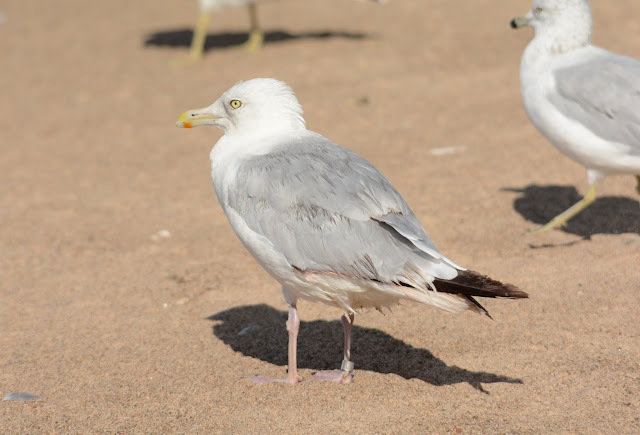 A simple field observation has added a tiny bit of enrichment to our knowledge of Herring Gulls in North America. I'm confident that there are older Herrings on this continent - and surely in Europe - we just have to get out there and spot them! I'm looking forward to relocating this bird...maybe on its 30th birthday? 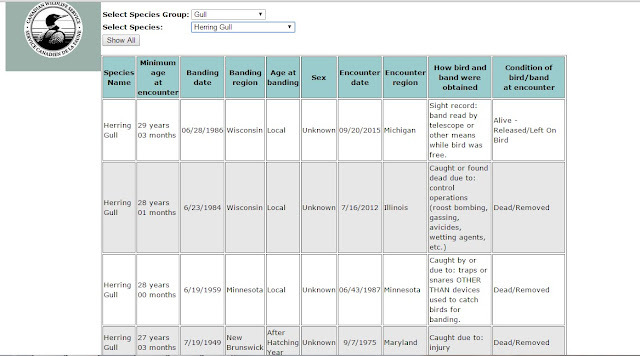 Below is a list of the 4 oldest American Herrings in the BBL database, with my bird now being the oldest. What makes this individual even more special is that it was alive and well (whereas the others were found dead). I spent several hours searching for banded Herring Gulls today in Michigan City, Indiana and New Buffalo, Michigan. My painstaking work was not left unrewarded. Of the 3 bands I was able to fully read, one return was of a 29 year-old! To date, this is now the oldest gull that I've personally recorded. Needless to say, I'm stoked! Adult Herring Gull. Photographed in New Buffalo, MI (20 Sept 2015). Fed Band #0846-10957. Banded as a chick in Egg Harbor, WI on 28 June 1986. American Herrings are said to average 15-20 year lifespans in the wild, but 30+ years have apparently been recorded, and 40+ have been recorded in captivity. Fed Band #1106-13326. Banded as a chick, East of Chambers Island. Wisconsin. 20 June 2009. Fed Band #1106-13485. Banded as a chick, East of Chambers Island. Wisconsin. 20 June 2009. Scapulars could pass for a retarded 2nd cycle, as well as the tertials. But the outer primaries appear pointy. Note the tips to P6 and P5 are dark gray (adjacent to the tertials). These feathers were not grown at the same time as the outer primaries. See below. Overall, the plumage looks more like a 1st cycle, but P5-P6 are confusing, as are the outer greater secondary coverts. Three of the central tail feathers appear to be from a different molt. A close up of the above image. Beside the 3 central tail feathers that show notable contrast and worn tips, a few of the lower scapulars have marbled tips and aren't from the same generation as the scaps with notched edges. Pointed outer primaries and 2 rounded primaries (P5, P6). The wing linings and axillaries resemble a 1st cycle. I've seen retarded 2nd cycle Herrings, but this one would be pushing the limits. On the other hand, it's hard to imagine the oddities with P5-P6 and the inner rectrices on a HY bird. EDIT: Thanks to useful comments by Mars Mussee, I've been reassured this is a hatch year bird. I'd love to hear of a hypothesis for the two newer primaries on the left wing, and the 3 older rectrices. From all of the banded Herrings that I've found in New Buffalo, Michigan, only one has originated from somewhere other than Door County, Wisconsin. So I was very happy when I learned today that both adults that I recorded on 07 September 2015 were from other surrounding Great Lakes colonies - one from Michigan and the other from Ohio. Adult Herring Gull. New Buffalo, MI. 07 September 2015. Banded as a chick on 06 June 2007 in Barbeau, MI (Upper Peninsula). Fed Band #1116-38317. Banded as a chick on 11 June 2010 in Sandusky, OH. Fed Band #1106-03794. Other highlights for the day included 5 Bonaparte's Gulls (including FOS adults) and 2 Lesser Black-backeds loafing on the hill at the landfill. The Lessers were a 3rd/4th cycle type and a 2nd cycle type. Last year I wrote about tertial replacement in late winter/early spring Ring-billed Gulls (1st cycles in their second calendar year). Traditionally, the literature has held that this age group seldom replaces tertials in the first plumage cycle. Interestingly, though, I found 32% of May birds (n = 194) had completely renewed tertials before dropping P1 (i.e. the onset of PB2). After documenting these birds with photographs and a short write-up, the question then became, "Are these tertials late 1st alternate feathers, or, early 2nd basic?". Peter Pyle, who I've found to be an invaluable resource while investigating these sort of questions, suggested the newer tertials may be part of the first plumage cycle and should be considered late 1st alternate. I was pleased with this reply, but thought it was odd that some of the last feathers to be molted in a prealternate molt were technically "flight feathers". However seeing that lower scapulars are sometimes replaced in late winter/early spring, it could make sense that some tertilas (which act as coverts to the bases of the primaries on the closed wing) would need renewing via PA1 as well. But what about hatch year (HY) RBGUs that replace tertials very early on, before the Fall season even hits? Ring-billed Gull (formative plumage). Chicago, IL. 29 August 2015. It's not at all the new lower tertial (T5?) that intrigues me, instead it's the 3 tertials sitting above - they have advanced, adult-like gray bases. What took place during feather-growth for this bi-colored pattern to form? I ask this rhetorically. The tips have a juvenile pattern, but the bases look like what would be seen on 2nd generation tertials. This month's birds all appear to be 1st cycles. A close look at the various feather tracts suggests some new feathers have recently molted in, while other feathers are old and worn. The overall appearance is that of 1st summer gulls. Immediately, a striking size difference is noted with the leftmost bird appearing the largest. The huge body and head, coupled with its dark back and white body is hard to confuse for anything other than a Great Black-backed Gull. 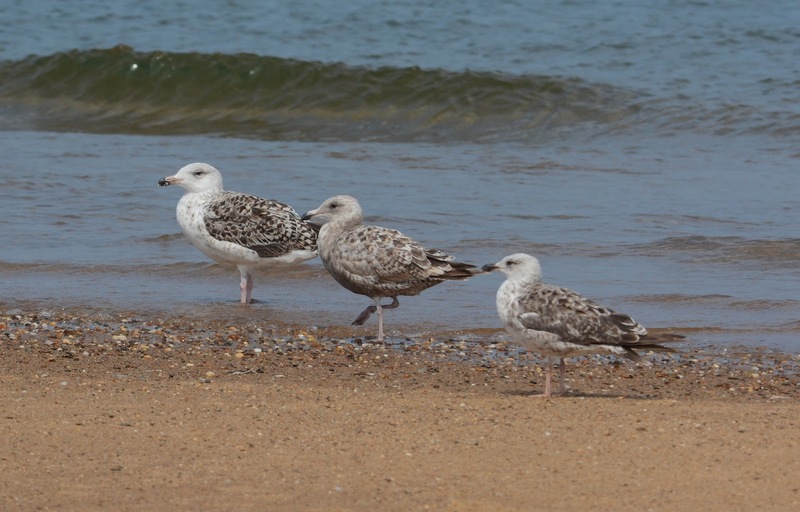 The middle gull is comparatively "medium" in size, and its plumage pattern/color look pretty typical of a 1st summer Herring - this variable age class will often show polka dot spotting on the newer, 2nd generation wing coverts as is seen here. Finally, the smallest of the three gulls has a mostly black bill, white head and darker, more solidly-filled wing coverts and tertials. It has long wings with an attenuated look to the rear - a classic 1st summer Lesser Black-backed Gull shape. This photo nicely demonstrates the general size differences between these 3 species when comparing same sexes. Provincetown, Massachusetts. 19 July 2015. Glaucous Gull (2nd cycle type). Grays Harbor County, Washington. 01 August 2015. Ross's Gull (adult type). Les Escoumins, Quebec. 4-6 August 2015. Exceptional. The farthest south a ROGU has ever been observed in August in North America. Iceland Gull (1st cycle). Les Basques County, Quebec. 04 August 2015. Lesser Black-backed Gull (3rd cycle). Humboldt County, California. 07 August 2015. Interestingly, a 2nd cycle LBBG was sighted at this same location last year in the month of August, resembling this month's bird in size and structure. Hence, it's thought this is a returning bird. Subspecies has been relegated to the expected North American race, graellsii. Lesser Black-backeds found along the Pacific seaboard should be closely scrutinized and Asian taxa must not be dismissed. Laughing Gull (juvenile). Jefferson County, Kentucky. 11 August 2015. Glaucous Gull (2nd cycle type). Manitowoc County, Wisconsin. 13 August 2015. Glaucous Gull (2nd cycle type). Muskegon County, Michigan. 13 August 2015. Likely the same bird noted in Wisconsin the day before, traversing Lake Michigan. Sabine's Gull (adult). Williamson County, Texas. 14 August 2015. Mew Gull (juvenile). Humboldt County, California. 19 August 2015. Several experienced birders from the West Coast suspect there may be a poorly understood movement of Mew Gulls in the month of August - juveniles in particular. Sabine's Gull (adult type). Minidoka County, Idaho. 19 August 2015. Little Gull (juvenile). Mason County, Illinois. 21 August 2015. Franklin's Gull (adult type). Baltimore County, Maryland. 21 August 2015. Yellow-legged Gull (4th cycle type). St. John's, Newfoundland. 23 August 2015. Franklin's Gull (juvenile). Sarnia, Ontario. 23-29+ August 2015. Sabine's Gull (adult). Maricopa County, Arizona. 25 August 2015. Slaty-backed Gull (adult). Pierce County, Washington. 29 August 2015. Mew Gull (juvenile). Lincoln County, Oregon. 30 August 2015. An early arrival, but also noted here to reinforce the thought that juvenile Mew Gulls may depart sooner, and farther south, than adults. Sabine's Gull (2 adult types). Barnstable County, Massachusetts. 31 August 2015.